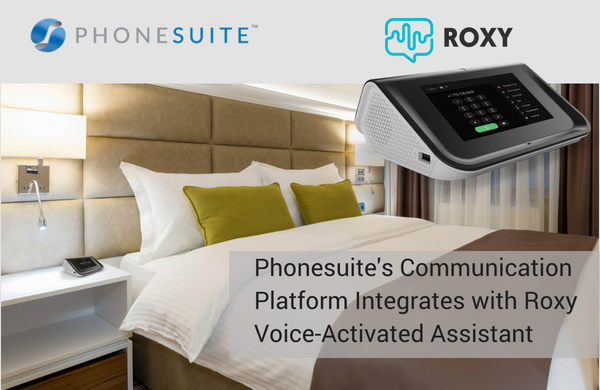 (Broomfield, Colorado) – May 17, 2018 – Phonesuite, (www.phonesuite.com) a leading provider of hotel voice technology solutions, announces the integration of its hotel PBX platform with Roxy (www.roxydevice.com), the speech enabled device designed specifically for hospitality that provides fully customizable in-room concierge services. This partnership is one of the first to combine a virtual assistant and a PBX system, enabling hotels to streamline their in-room devices and make voice-activated calls directly through the device. The Phonesuite PBX integration with Roxy is available now for hotels. Phonesuite will demo the Roxy device in Booth #2101 at the upcoming HITEC conference in Houston, June 18-21. For information, please contact cam@roxydevice.com and sales@phonesuite.com.